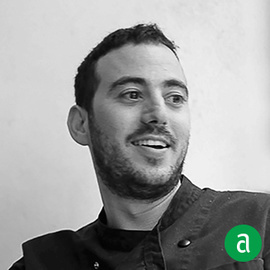 Daniel Rose, Executive Chef and Partner of Le Coucou in New York, shares his career timeline and advice for up-and-coming talent. The best way I know how to keep my cooks happy is to allow them to cook with high quality products. I was very privileged to learn to cook with excellent chefs that took the time to mentor me. They took the time to teach me with careful explanations and most importantly allowed me to make mistakes and how to learn from them. I now see it as my responsibility to honor their generosity by continuing to do the same with the cooks that work with me. The best advice I have ever received was from my first chef, circa 2000, when I was working in a small excellent restaurant in Brittany. He once said to me: "do what you love and you will never feel like you’re working." That has always stuck with me. I cannot be a successful leader and chef without my excellent team. I choose to surround myself with people who have different experiences and expertise than I do. It is very easy to build a familiar world around yourself, but it is much more interesting to challenge that vision. It may be the reason I am opening a restaurant in NYC. I like a quiet but bustling kitchen where we can actually hear whatever is cooking in the pan.